Time goes fast, and the few days off that we spent in Hesse on the occasion of a family visit date back some time already. However I don’t want to miss to share with you some nice foodie experiences and discoveries that we made in the uplands of Taunus as well as in and around Frankfurt on Main. We just love the local mixture of rustic cider pubs, abandoned orchards, hip urban cafés, and exotic food shopping opportunities at Kleine Markthalle downtown Frankfurt… At the latter place, I got an exciting exotic herb as a present – it’s the main ingredient of today’s recipe which will follow at the end of the post. The heart and soul of our stay had been our hikes through the beautiful Taunus uplands which ended up among old fruit trees that have not been cropped. You can easily tell the difference between farmed orchards and those who have grown wild by the form of the trees, the size of the fruits and the massive windfalls around the latter. We enjoyed fully ripe small yellow and beautiful purple plums as well as wonderful pears after we had been lucky already with wood raspberries and black berries in the woods. But I also tasted maybe the worst apple I ever had – you never know what those senior trees will offer you ;-). A regional highlight that we never tire to visit is Kronberg in Taunus. A beautiful castle that had been home to the Kronberg knights for centuries, historic buildings which date back to the High Middle Ages, wonderful gardens with small public footpaths – and, of course, food shopping opportunities! At the most lovely little shop Zeit & Genuss (German language), I bought Hessian chutney with sourcrout, apple wine jelly and apple wine mustard. The latter has been tested already – so fruity and hot, we just love it. Another foodie’s paradise is definitely the indoor market Kleinmarkthalle (German language) right in the centre of Frankfurt on Main. It has not been my first visit there, but my first as a food blogger. Big difference, isn’t it ;-). I had high hopes for regional treats and some not so regional inspirations, and indeed, I made some finds. 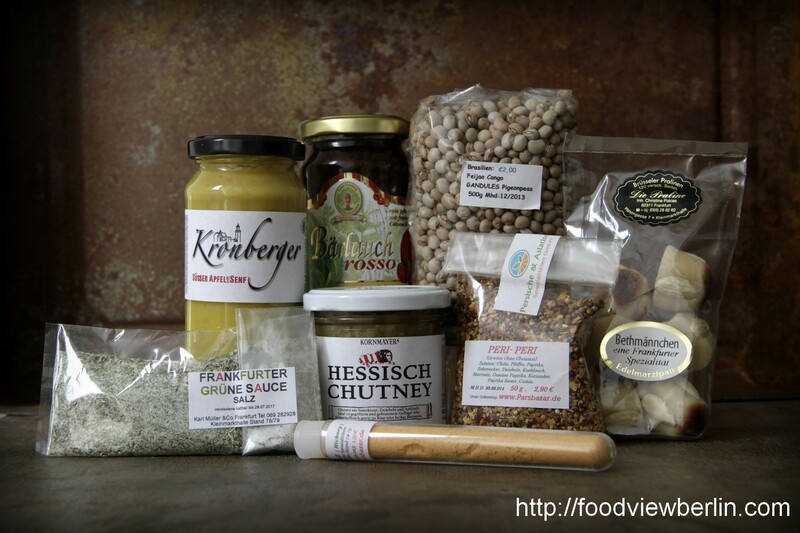 Local ramson pesto at Lebe Gesund (German language), Bethmännchen (a local marzipan treat) at Die Praline (German language), sea-salt flavored with Frankfurt green sauce herbs as well as smoked salt and piri piri at Karl Müller Gewürze (German language) and Parsbazar . Things got even more interesting at Wong’s Asia-Latino: I had asked for Brazilian treats as I am excited about this country’s cuisine since lately, and the vendor recommended feijao conge to me. I have tried those beans in the meantime, and they have a delicious nutty taste. We talked a little bit about food blogging as well, and in the end, she gave me a bundle of Peruvian herbs as a present that another food blogger that she knew is very fond of. It’s called huacatay (the herb, not the blogger – unfortunately, I forgot his name) and I later learned that it’s also called tagetes minuta. I was so happy about this present, and at the same time I had some sorrows how to get this back home to Berlin. But huacatay is a strong fellow, it survived the journey and still tasted amazing, a bit like sweet mint. There are some more actions to mention… Not to forget about some cooking session which involved the whole family – shopping for all ingredients and herbs that you need for a date salad and an Oriental frittata can be adventurous if you do so in one of the region’s many small towns, but we were quite successful (except for sumach). We had a lot of fun together and a great dinner in the beautiful garden – you can find the recipe for date salad with almonds and bread here, and the recipe for the frittata will follow soon in another post. Of course, we also gave visit to one of the long-standing Frankfurt cider pub Fichtekränzi where we had Handkäse (we chose without „music“ like the Hessians say – which means without onions) and Frankfurt green sauce. The next day faced quite a contrast: On a bicycle trip along river Main, we found a lot of things changed at Offenbach’s harbor neighborhood with modern architecture, industrial romance, a temporary urban farming lot (German language) and the most beautiful café and cultural center Hafen 2 (German language) in the middle of it all where we had a nice rest and some fine cake in a most beautiful half-vintage, half modular modernism atmosphere. All told, we had most beautiful days in Hesse – and maybe there’s some discovery in it for you as well! Clean the herbs, peel the garlic cloves, and put into a pot that is suitable to use with an immersion blender (high rims). Add all other ingredients for the pesto and blend until you get a smooth paste (if you prefer your pesto a bit more chunky, stop blending a bit earlier). 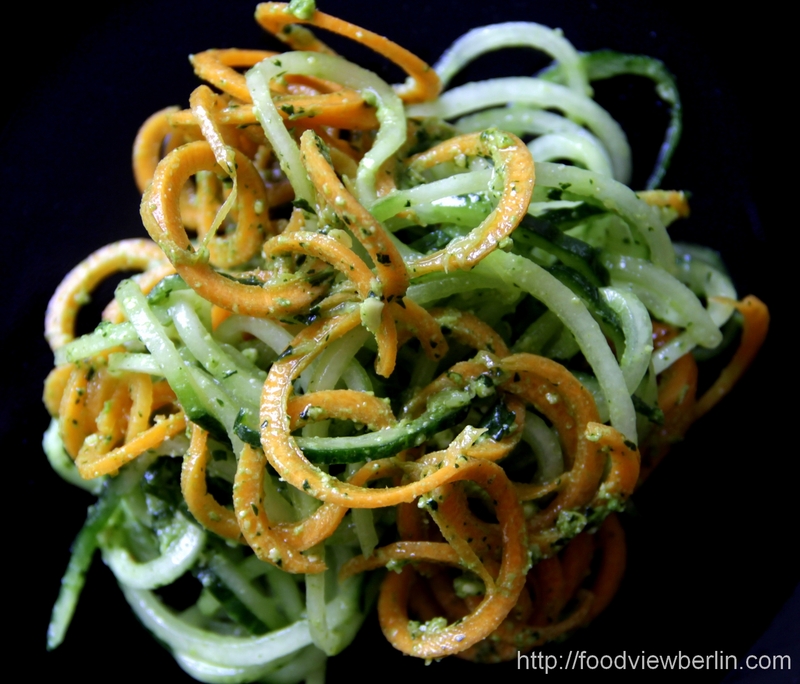 With a spiral slice, slice the cleaned vegetables into, well, spirales – that’s what a spiral slicer does ;-). 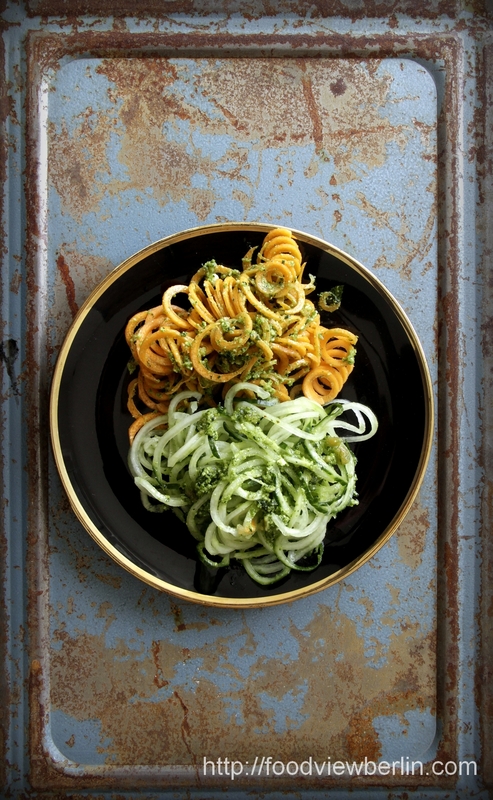 Mix the two vegetables and add the pesto. A perfect raw treat, and if you leave away the cheese, it’s even vegan. Hessen ist schön und ziemlich bunt! Vor allem in kulinarischer Hinsicht. In der Region zwischen Taunus, Frankfurt am Main und umzu können wir das bei unseren dortigen Familienbesuchen immer wieder feststellen, was für eine wunderbare Ko-Existenz Äppelwoi-Kneipen, hippe Cafés, aufgegebene Obstbaumwiesen und Markthallen pflegen. Alles da, und wir waren überall schon oft dabei. Zu den Highlights gehörten diesmal: Wandern im Taunus mit Food-Shopping und Obstpflücken, die Frankfurter Kleine Markthalle und ein Apfelweinschenken-Besuch (ist das nicht ein herrliches Wort), Radeln am Main mit Kaffeetrinken im Offenbacher Hafen und Urban-Farming-Gucken sowie ein herrlicher Abend mit gemeinsamem Kochen mit der ganzen Familie. Und ein Rezept ist bei alledem natürlich auch herausgekommen. Kräuter waschen, Knoblauch schälen und alle Pesto-Zutaten mit dem Stabmixer pürieren – je feiner man sein Pesto haben möchte, um so länger. Mit einem Spiralschneider das gewaschene Gemüse in Spaghetti-Form schneiden und roh belassen – daszu hat mich Heike von der Regenbogenkombüse inspiriert. Normalerweise brate ich ja zumindest die Möhren. Aber an heißen Spätsommertagen passt das roh sehr gut. 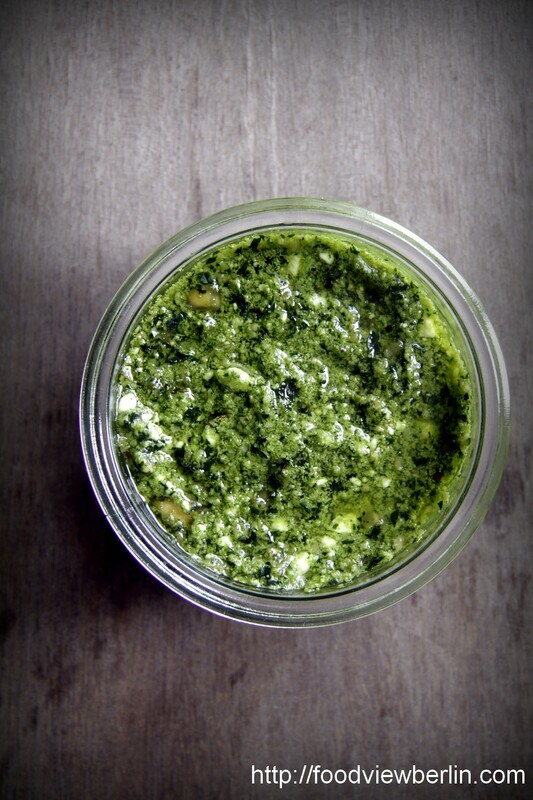 Mischen und mit dem Pesto mixen. Schon fertig – guten Appetit! Und was hast du da wieder für ein interessantes Kraut ausgegraben? Huacatay – noch nie gehört. 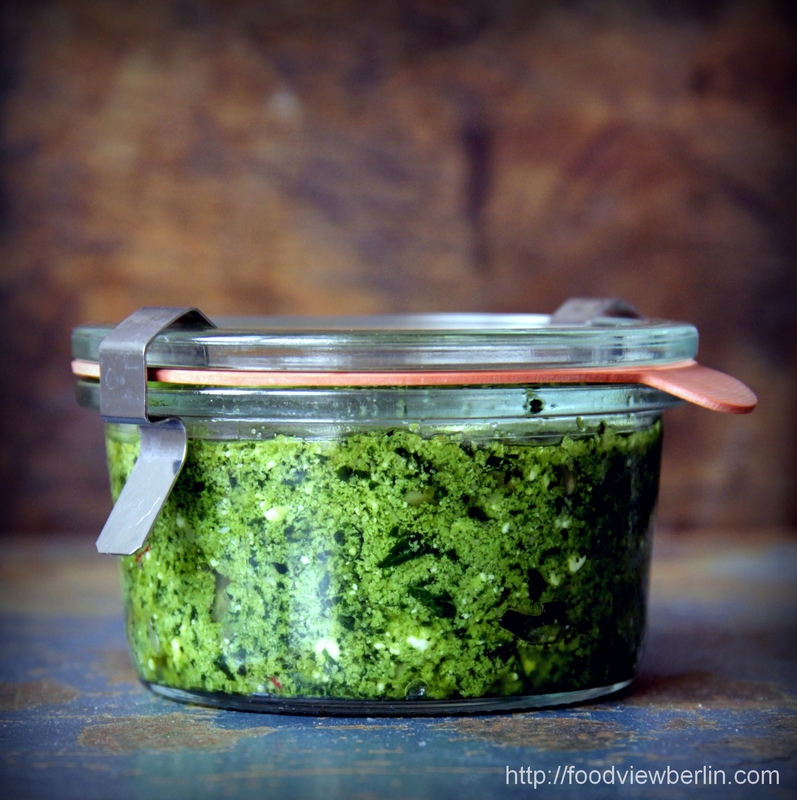 Das Bild von dem Pesto sieht genial leuchtend grün aus! Und ich brauche definitiv einen Spiralschneider. Was für einen hast du? Danke, Eva! Wir kennen die Ecke dort sehr gut – Manches muss man dort kennen, um es aufzuspüren, als Ortsunkundiger man kann leicht daran vorbeifahren. Ich kannte Huacatay bislang auch nicht, auch nicht unter dem Namen Tagetes minuta. Aber die Suche danach lohnt sich, es schmeckt sehr eigen. Ich habe einen Spiralschneider von Lurch, Spirali heißt der. Ob das nun der beste ist, weiß ich nicht – ich finde ihn etwas schwergängig und nicht ganz präzise in Sachen gleichmäßge Dicke. What beautiful photographs! I’m anxious to try that recipe- looks divine. Thank you! Have fun with the recipe – hope you like it. Nicht wahr? Ich hatte vorher auch noch nie etwas davon gehört. Hoja santa klingt aber auch sehr spannend – die Kräuterwelt Mexikos ist mir bislang ehrlich gesagt komplett verborgen geblieben. I’m thrilled that you got inspired by the post, Melissa! How wonderful that you love hiking, too – and yes, isn’t it great fun to discover a new city by its food :-)? Wish you so much fun for your next city trip and hike alike.